Thinking about selling your medical device in Brazil? If so, you should know that the Brazilian medical device and IVD market is complex. The changing legislative landscape combined with the limited resources at the Brazilian Health Surveillance Agency (ANVISA) often cause frustration for domestic and foreign manufacturers. 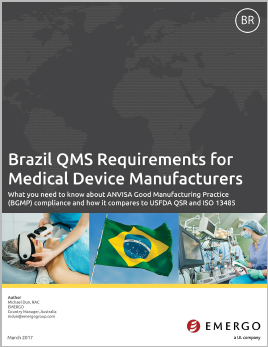 What is Brazilian medical device/IVD GMP? Who must meet BGMP requirements? What is the submission process? What does the future hold for GMP requirements in Brazil? You'll learn all this and more in this white paper. Michael Dun, RAC is the Australia Country Manager and Director at Emergo. He has more than 13 years of experience in quality systems, auditing, regulatory affairs, and research and development across the biotechnology, IVD and medical device manufacturing and services industries. His areas of expertise include QMS implementation and audits, risk management, and device registration and documentation in the US, EU, Brazil, and Australia.